An ancient pinball ban was actually enforced in the town of Beacon, New York, shutting down a local business. 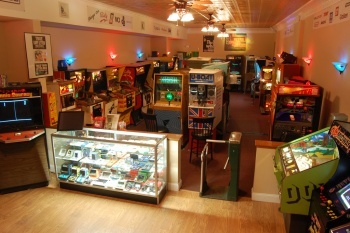 Fred Bobrow's Retro Arcade Museum in Beacon, New York seems like an awesome place. He's got hundreds of pinball and arcade games that date back to as early as the 1950s, from Pong to Frogger, on display and on free play (assuming you've rented the place). It's so cool in fact, that's it's been completely shut down due to a law in Beacon that bans pinball arcades. What year is it again? Bobrow told CNN: "It turns out that they were able to prevent me from operating by enforcing an arcane law that bans pinball arcades in the town of Beacon. The fine is $1,000 a day, or jail." The Retro Arcade Museum was shut down by a bunch of squares after being open for only 18 months. The pings, pongs, and squeals of delight must have really annoyed someone on the Beacon City Council. The law, like other well documented bans on pinball over the years, came about because lawmakers at one point thought pinball was run by the mafia, encouraged gambling, corrupted innocent youth, and attracted a bad element (i.e. people that enjoy fun). Despite some local officials saying that Bobrow's museum is a "good fit" with Beacon, and that it could even be a tourist attraction, the Beacon City Council is dragging their heels to change the pinball law. It's been under discussion for over two months. Beacon's mayor explains: "The legislative process really does take its time ... It's a process that really can't be done very quickly because we want to do it right rather than right away." Somebody must have forgotten to tell him that they're discussing a law banning pinball, for goodness sake. If officials take too much longer, Bobrow could be in trouble. "The town is on their own timeline that doesn't coincide with business," he says. "In business, you have the be open everyday." Let's hope the city council is able to see that the banning of metal balls hit with flippers for fun is completely moronic. Bobrow's outfit isn't even the type that attracts a seedy crowd, it's well maintained and more of a museum on free play. Sorry everyone, this situation combined with the outrage over Marvel Happy Meals has made me decide to find a new planet to live on. I'll miss you all.